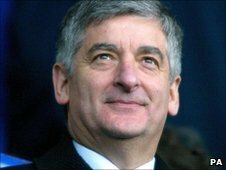 Former Manchester City chairman David Bernstein has been voted in as the new chairman of the Football Association. Bernstein, 67, was approved unanimously by the FA board in December, and the FA Council has endorsed the appointment. "It is a great honour," said Bernstein. "I thank the nominations committee, the board and council for placing your trust in me." Bernstein also made it clear that he intends to build stronger relationships with football's decision makers. A lack of influence within world football's governing body, Fifa, is thought to have contributed to England's failed 2018 World Cup bid. "I want to build more effective relationships with international football bodies," added Bernstein. Is Bernstein the right man to take the Football Association forward? "There are many lessons to be learned from the events of last year." A parliamentary committee is also carrying out an inquiry into football governance and the government are keeping a close eye on the situation to ensure the FA is "fit for purpose". The former Manchester City chairman added: "Outside the football family we must increase the effectiveness of our relationships whether it be with other sporting bodies, the government and broader stakeholders. "Clearly recent developments and the forthcoming select committee hearings make this even more relevant." Although former FA and Arsenal vice-chairman David Dein had been the initial favourite to secure the post, Bernstein was recommended to the FA board by a nominations committee led by Bolton chairman Phil Gartside. He replaces Lord Triesman, who was forced to resign last May after he suggested there was collusion between Spain and Russia over their 2018 World Cup bids. Roger Burden, who succeeded Triesman as acting chairman, withdrew his application for the permanent role in protest against Fifa after England's 2018 World Cup bid ended in failure in December. "I want to pay tribute to Roger who has done a tremendous job over the last eight months as acting chairman," continued Bernstein. "He has seen the organisation through some challenging times and led it with great dignity and integrity. "I am fortunate to be able to draw upon his experience and insight as a colleague on the board." One of Bernstein's key roles over the coming months will be to appoint Fabio Capello's successor as England manager. The Italian has already stated that he will move on after the Euro 2012 finals, which are due to be held jointly by Poland and Ukraine in 18 months. Tottenham manager Harry Redknapp is the bookmakers' favourite to succeed Capello, although the Italian's assistant and England Under-21 boss Stuart Pearce, former Aston Villa manager Martin O'Neill and ex-Blackburn boss Sam Allardyce are all contenders. "Over the past few weeks I have been doing a lot of listening," Bernstein continued. "I have met many people representing all areas of football in this country to hear their thoughts and ideas on the current issues facing the game. Their input has been invaluable. "It has confirmed my view that the FA is an outstanding organisation with talented, committed people doing a huge amount of great work of which we should be justifiably proud. "Understandably, much of this work receives little publicity due to the focus on higher profile issues. That was particularly true in 2010. "By bringing stability to the top of our organisation, I hope to create an environment within which all the positive work that we do is better understood and appreciated." During Bernstein's nine years at Manchester City, five of which were spent as chairman, the club returned to the Premier League. He resigned in 2003 after a boardroom battle with then-manager Kevin Keegan over strategy and the signing of striker Robbie Fowler. Since then, Bernstein, who is a chartered accountant, has been a director of Wembley Stadium and has been chairman since 2008.